Rose milk tea is a delicious combination of black tea infused with floral, aromatic rose syrup and a splash of warm milk. A perfect and comfort drink to warm up inside out in this cold weather. I loved the idea of infused tea when I tried Starbucks blossoming rose tea. 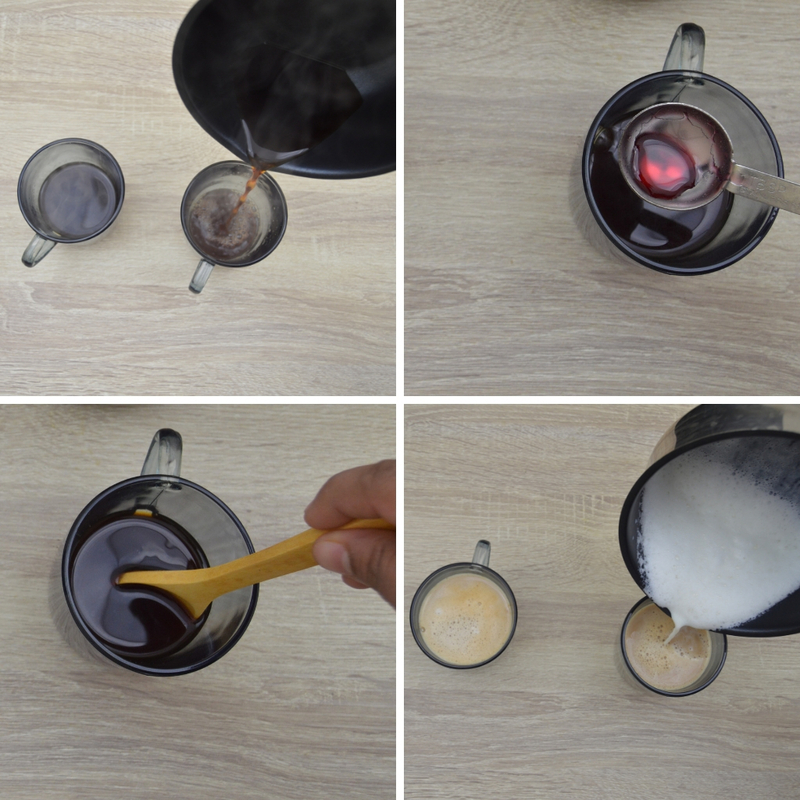 This is not a copycat recipe of starbucks, I tried different options to get the right amount of floral aroma and flavour. Finally I could achieve it with rose syrup as it infuses not so intense floral aroma unlike rose water. 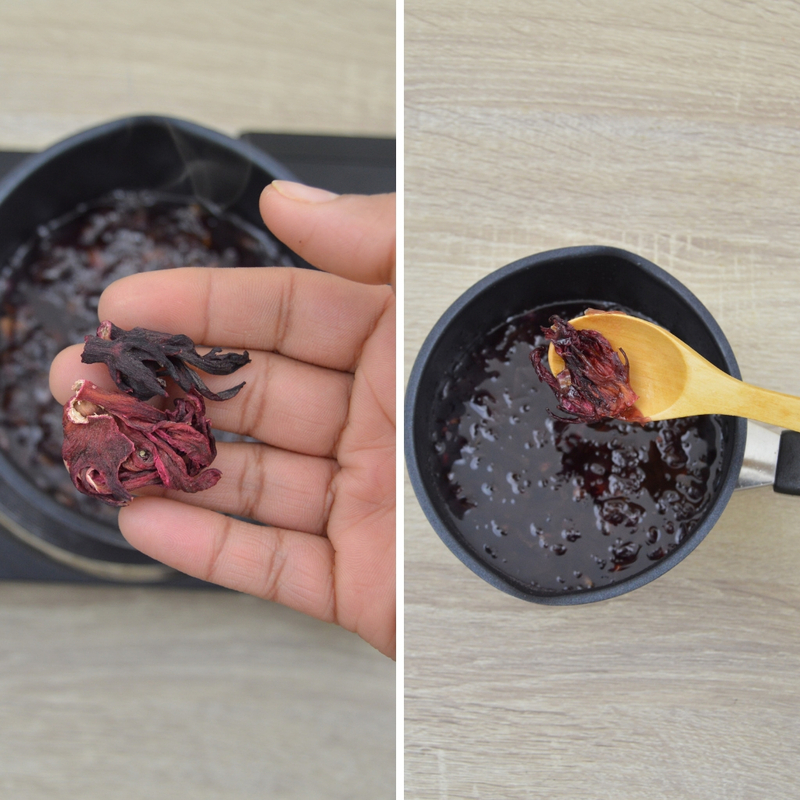 To keep the syrup natural without adding any artificial colouring agents, I used dried hibiscus petals. As the days get shorter and colder we all know winter is making its way. Eventually we change our choices to winter warmers like soups, pies along with kashayam, masala chai,and infused tea. A mug of creamy, fragrant tea with floating rose petals / petal dust is just the perfect way to cozy up at the end of a long chill day. 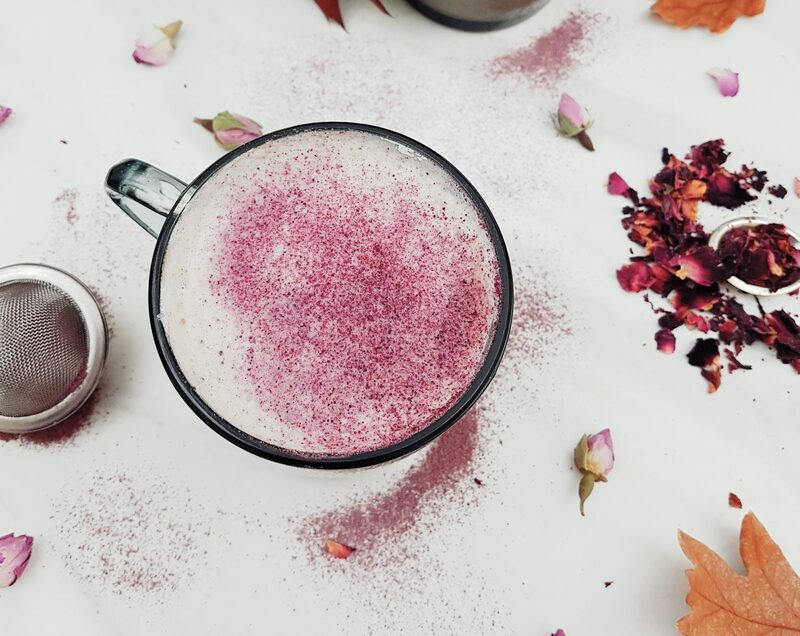 This easy to make rose milk tea recipe is definitely a treat for the taste buds. Recipe for rose syrup is simple to make at home. This recipe requires just 3 ingredients rose petals, water and sugar to make. I have used dried rose petals to make this syrup. To make this simple rose syrup just boil water, sugar and dried rose petals until sugar dissolves. I have used dried hibiscus petals as a natural food colouring agent, it was not steeped for long to impart any noticeable floral aroma. You may add few drops of rose water to the syrup if you prefer intense floral aroma and flavour. This syrup adds a delicate, sweet, aromatic and subtle floral notes to any drinks hot or cold. This versatile syrup makes a great base for any drinks such as rose lassi, tea, coffee, cocktail, flavored lemonade, falooda, milkshakes. Place water, sugar and rose petals in a sauce pan, bring it to boil on medium high heat. Now reduce the heat to low and simmer for about 15 minutes or until sugar completely dissolves and mixture thickens. Turn off the heat. Finally add dried hibiscus petals and steep for 3-4 minutes. 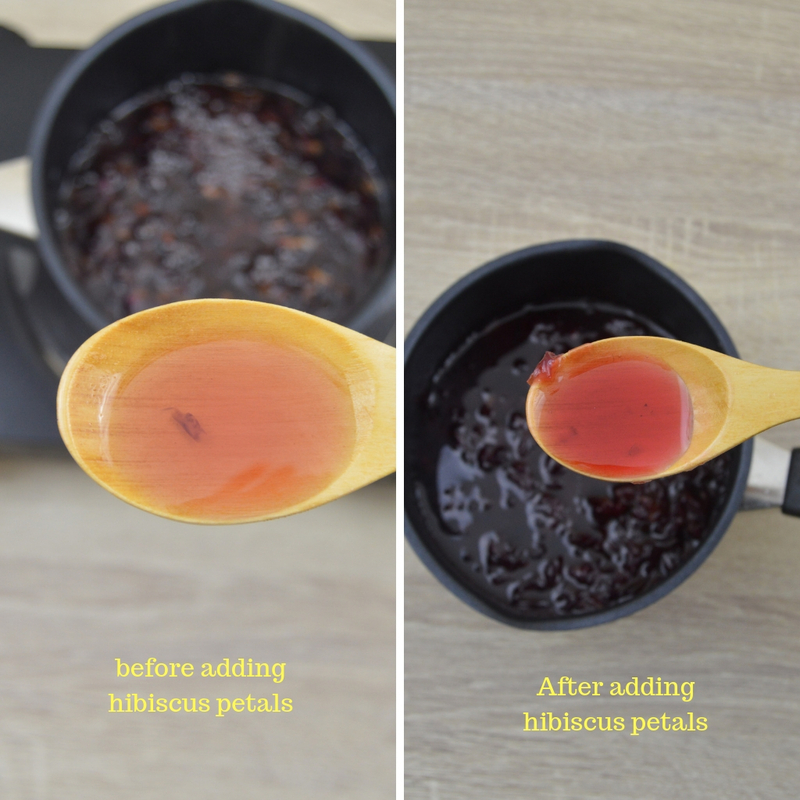 Remove hibiscus petals and allow the syrup to cool down completely. Strain the syrup and discard rose petals. Store the syrup in sterilised glass container/bottle in fridge. The above measurements yields 250ml syrup. Store this syrup in fridge until you are ready to use. You may keep it in fridge for around 3 months. While straining the syrup press the rose petals with back of spoon to extract as much syrup as possible. Syrup thickens once it cools down. To get right consistency, just lift the spoon out of pan and make sure syrup lightly coats to the spoon. Do not steep hibiscus petals for more than 5 minutes. 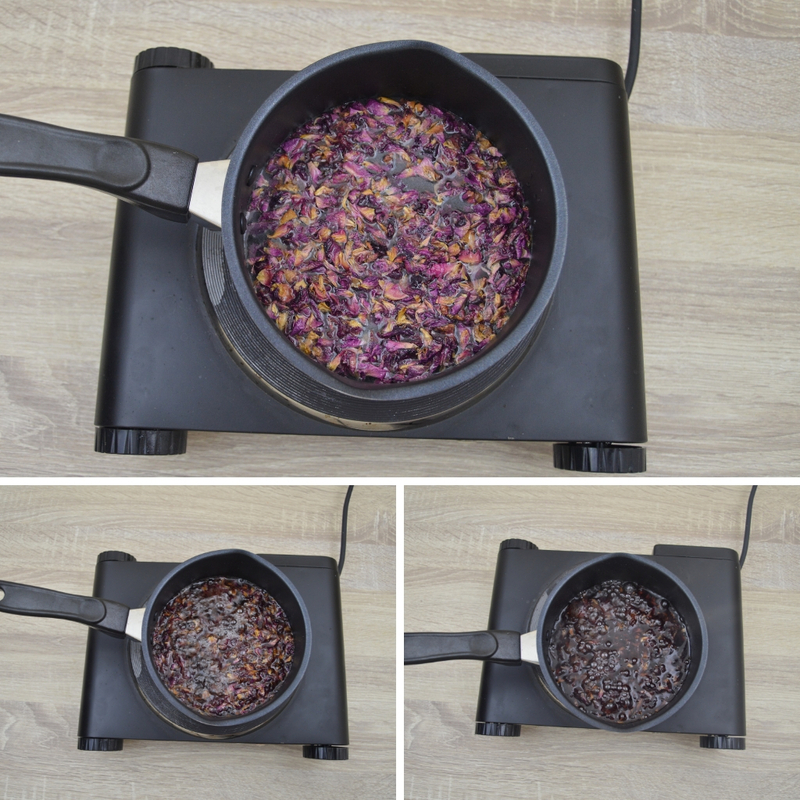 Hibiscus petals acts as a natural colouring agent, steeping for a long time results in imparting its aroma in the syrup. Swap refined sugar with coconut sugar or palm sugar for healthier version syrup. You may swap dried rose petals with fresh organic edible rose petals. Addition of hibiscus petals is optional, you may skip if you do not have them. In the below image you can see the colour difference before and after adding hibiscus petals. Rose milk tea is a rose syrup infused in black tea with milk. Steep a tea bag in water, mix in rose syrup and finally add milk. You may top up with dried petals/ rose petal dust if you wish to. This recipe is pretty easy and quick to make if you have a pre – made rose syrup. Rose syrup is time taking process though not much may be around 15 minutes. Best part is you can make a batch of rose syrup and store it in fridge. This syrup stays good for nearly 3 months if stored properly in clean, sterilised and dry glass bottle. 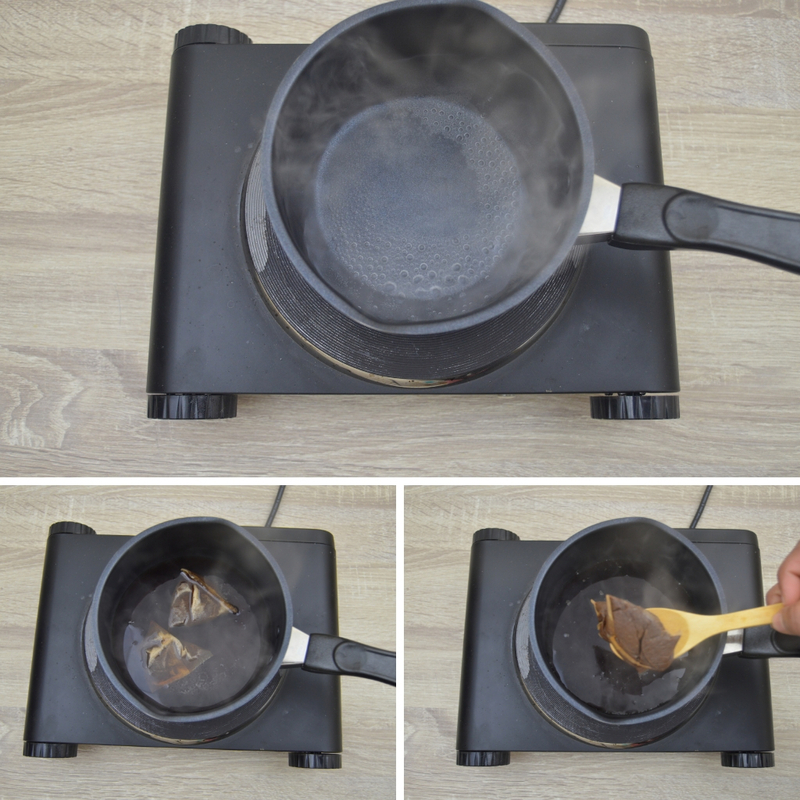 Bring water in a saucepan to rolling boil and switch off the heat. Now add teabags and steep for 5 minutes and discard the tea bags. Warm milk and foam with milk frother for 30-40 seconds. Now mix in 1 tbsp rose syrup in each cup and add milk. Enjoy rose milk tea while hot. For vegan version use almond milk, soy milk or any plant based milk. Add rose syrup depending on how sweet and intense rose flavour you prefer. You may add few drops of rose water along with syrup if you prefer intense flavour but not the sweetness. 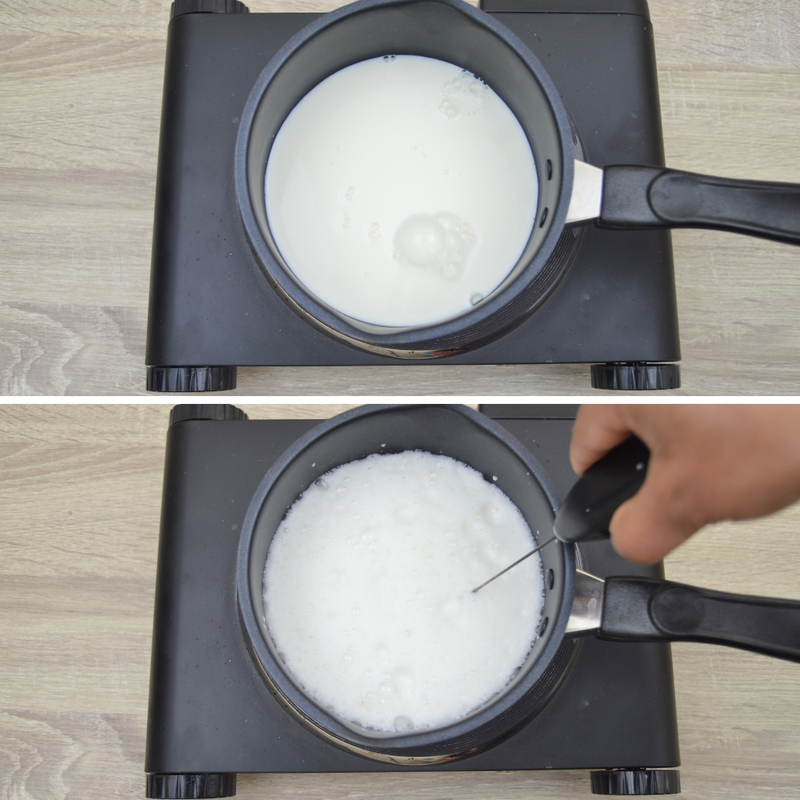 Adjust milk and water ratio as per your preference. I personally like 1:1 ratio. Recipe for rose syrup is simple to make at home. This recipe requires just 3 ingredients rose petals, water and sugar to make in few minutes. 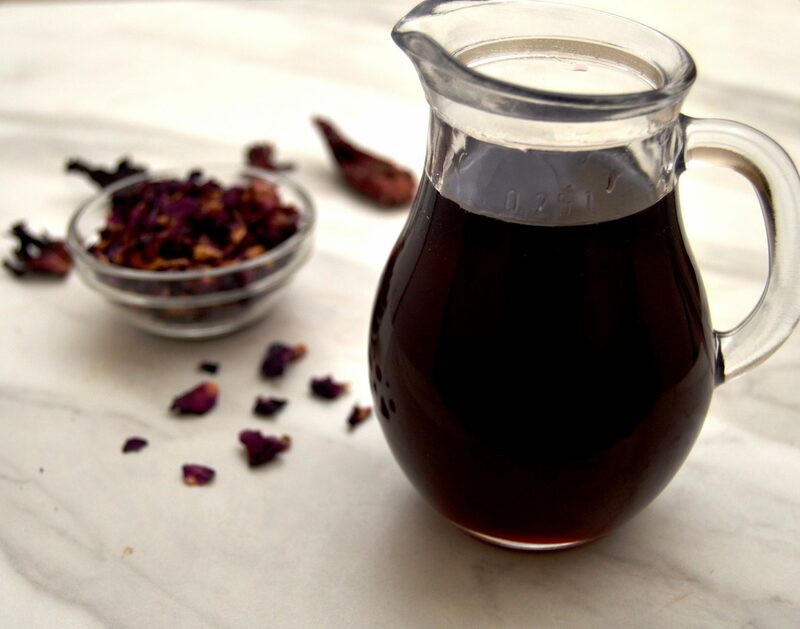 I have used dried rose petals to make this syrup. To make this simple rose syrup just boil water, sugar and dried rose petals until sugar dissolves. I have used dried hibiscus petals as a natural colouring agent, it was not steeped for long to impart any noticeable floral aroma. You may add few drops of rose water to the syrup if you prefer intense floral aroma and flavour. Rose milk tea is a rose syrup infused in black tea with milk. Steep a tea bag in water, mix in rose syrup and finally add milk. You may garnish with dried petals if you wish to. This recipe is pretty easy and quick to make if you have a pre - made rose syrup. Rose syrup is time taking process though not much may be around 15 minutes. Best part is you can make a batch of rose syrup and store it in fridge. This syrup stays good for nearly 3 months if stored properly in clean, sterilised and dry glass bottle. Wow! 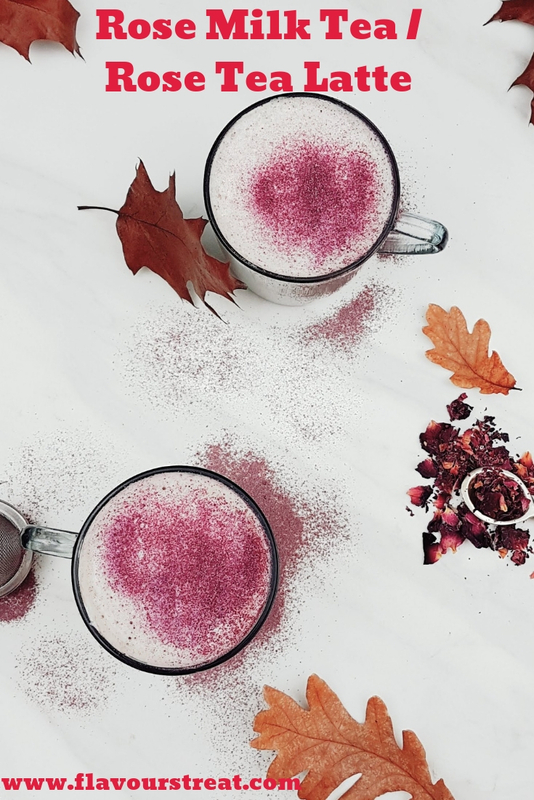 This rose milk tea looks so warming. 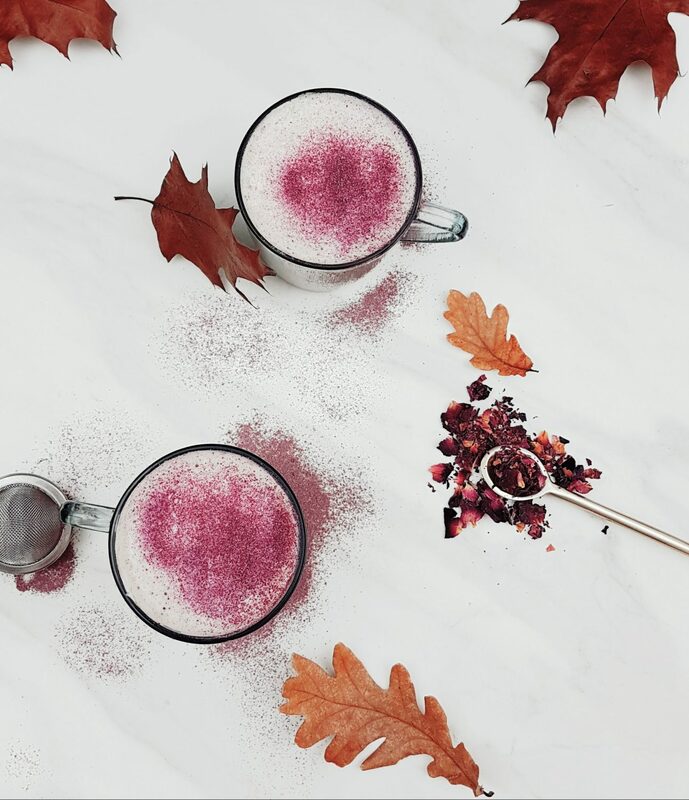 It’s the perfect drink for the chilly season ahead! Indeed it is a perfect drink in cold weather. Love all your tips! Super helpful. Thanks for sharing! This is great! I have tons of wild roses on my property! I am going to make a note to dry a bunch of petals next year so that I can make this delicious tea! Wow that’s plenty. I am sure you will like it. There are so many recipes to try with rose syrup and dries rose petals as well to try Beth. It looks and sounds delicious. I love rose flavor. Thank you for the step by step pictures. Glad you like the recipe. I hope you do try and let me know how you liked it. 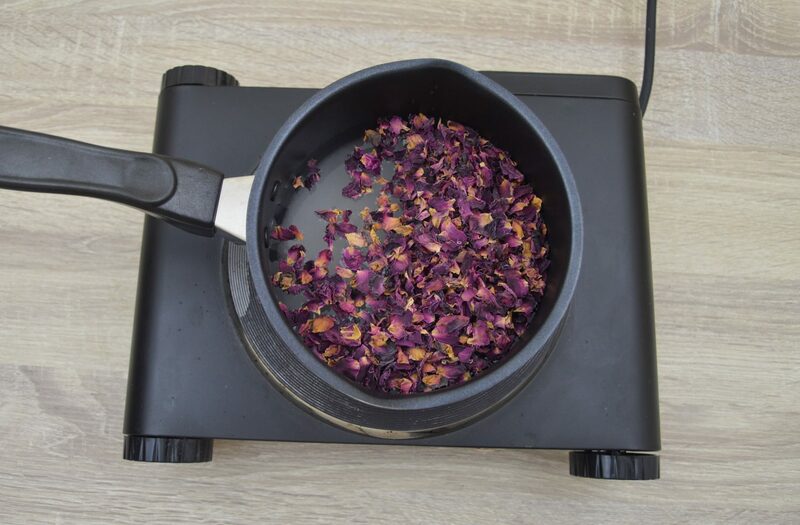 What a lovely idea of using rose petals in making tea, a perfect aromatic and comfy beverage to beat the cold.